DAILY TOURS TO THE NEW HUA HIN HILLS WINERY. 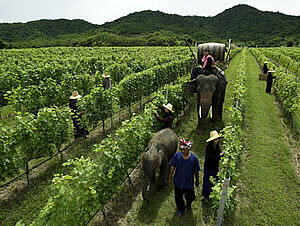 Hua Hin Hills Vineyard is built on a former elephant corral, a sublime place where wild Asian elephants were domesticated. The terrain, comprising mostly of loamy-sand and slate, is conducive to the cultivation of grapes providing the seaside resort town of Hua Hin with its first boutique vineyard. Grapes are carefully tended at this estate vineyard. The varietals grown each year are used exclusively for the award-winning Monsoon Valley Wines. Take this opportunity to learn about wine making and taste samples from the vines grown right in the Hua Hin Hills vineyard. The vineyard tour package includes fresh grape juice, wine and snack pairing, as well as a presentation on the Hua Hin Hills Winery. In addition visitors can enjoy a ride through the vineyard on elephants – the only vineyard in the world where this is possible. A fully enjoyable and fun filled afternoon for all. Explore wines from new latitudes at Hua Hin”s newest attraction, Hua Hin Hills Winery. Daily tours are now available with transportation from Blue Lagoon Resort to Hua Hin Hills Winery and return provided. The tour is an all day affair including wine tasting, with either a light snack or lunch. Their locally produced wine, Monsoon Valley Wine, is available for purchase during the tour. WEEKEND SPECIAL, Jazz in the Vineyard, Every Saturday afternoon during harvest period in March, different jazz bands play from 12:00 noon till 5:00 pm. The Damnoen Saduak Floating Market is located at Damnoen Saduak District, in the Ratchaburi Province, about 105 kms from Bangkok and approxmately 130 kms from Hua Hin. According to history around 1866 King Rama IV ordered that a 32 kms long canal be dug at Damnoen Saduak. This canal would connect the Mae Klong River with the Tacheen River. 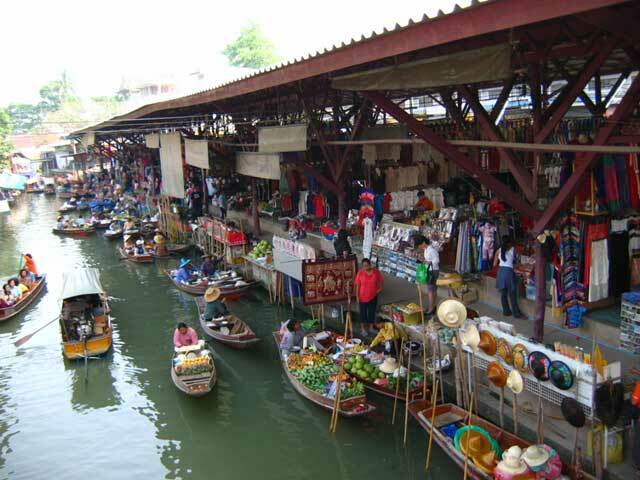 The Damnoen Saduak Floating Market is a very attractive place for tourists to see the old Thai style and traditional way of selling and buying fruits, vegetables, etc., from small boats. Tourists will also see traditional Thai houses, the way they live and travel by boats, and please try riding on a small boat to experience the floating market and to see how local Thai people live on the river. A fantastic local experience, a trip to the Damnoen Saduak Floating Market is well worth doing. Totally chaotic, small “khlongs” or canals are filled with flat boats piled high with fresh produce, each jockeying for position and paddled by local ladies ready to stop and bargain at a moment’s notice. It”s colourful, noisy, touristy, but great fun. During the long-tail boat ride to market, you’ll pass fruit orchards, traditional teak houses and local people going about their daily lives. This ia a worthwhile trip that leaves in the morning and returns in the early evening. Great fun for the whole family. Air conditioned Toyota Minivan vehicle with English speaking guide. Transportation to Floating Market and return to Hua Hin. Admission fee as mentioned on this program. Personal expenses such as food, drinks, tips, etc.